Typical size of adults is small - 11 - 15 inches. A small constrictor with a stout body and smooth shiny small-scaled loose and wrinkled skin which gives the snake a rubbery look and feel. Uniform in dorsal color - light brown, dark brown, pink, tan, or olive-green above, and yellow, orange, or cream colored below. Usually no pattern below, but sometimes there is dark mottling. Young snakes are pink or tan, and can be brightly-colored. Eyes are small with vertically elliptical pupils. The tail is short and blunt and looks like a head. When threatened, the snake hides its head in its coiled body, and elevates the tail to fool an attacker into attacking the tail. Snakes with scarred tails are common. Nocturnal and crepuscular, sometimes active in daylight. Sometimes active in weather that would be too cold for most reptiles, with surface temperatures in the 50s. A good burrower, climber and swimmer. Often found under logs, boards and other debris, sometimes on roads at dusk. Eats small mammals, birds, and, lizards. Found only in a few disjunct areas in montane southern California in the San Bernardino, San Jacinto Mountains. 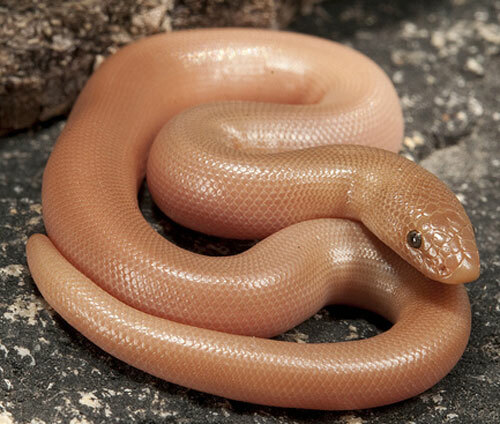 "The southern rubber boa is known from several localities in the San Bernardino Mountains in San Bernardino County, near Idyllwild in Riverside County, and on Mount Pinos in Kern County."... "Possible intergrades between the southern rubber boa and the rubber boa found in the Tehachapi Mountains and on Mt. Pinos warrant further study." Formerly, one species of Charina was recognized, Charina bottae, with three subspecies. Some herpetologists still only recognize one species of Charina, Charina bottae, with either no subspecies or with two subspecies - Charina bottae bottae - Northern Rubber Boa, and Charina bottae umbratica - Southern Rubber Boa. Others recognize two full species of Charina, as is done on this site - Charina bottae - Northern Rubber Boa, and Charina umbratica - Southern Rubber Boa. Conservation Issues (Conservation Status) Common where it occurs, this snake is considered a threatened species due to development and habitat degredation in its limited range.